Frankie Vah, ranting poet, must be in his mid-fifties now. It’s a long time since the 1987 election, when Frankie toured the country as a support act for indie band The Midnight Special. 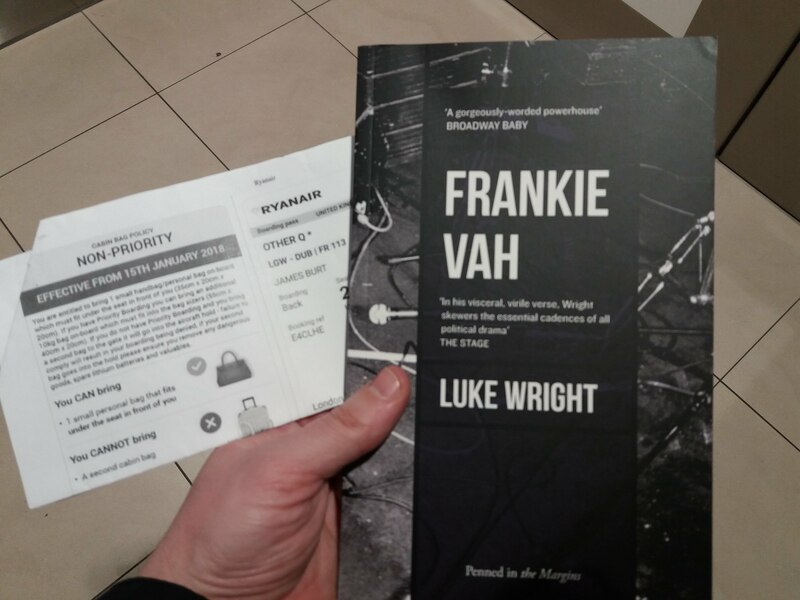 Vah would be completely forgotten if he were not the subject of Luke Wright’s new play, Frankie Vah. By looking at the problems within the Labour party of the 1980s, Luke has found an interesting way to approach contemporary issues. There’s an incredible amount of research into the time – Kinnock: The Movie, an election broadcast, is an essential point, as is the deputy leadership contest between Dennis Healey and Tony Benn. Somehow, this level of political geekery is passed off gently, introducing the background without obvious exposition. And it’s done well. The show I saw was followed by a Q&A with various politicians who’d attended gigs at the time, possible even ones Vah had performed at, and they accepted the reality of Luke’s play without question. Obviously, I never heard Vah perform, but Luke’s performance does an incredible job of summoning an energy and outrage around Thatcherite politics. Lady Winter, Luke’s reconstruction of the sort of poem Vah might have done, is pitch-perfect and stirring. 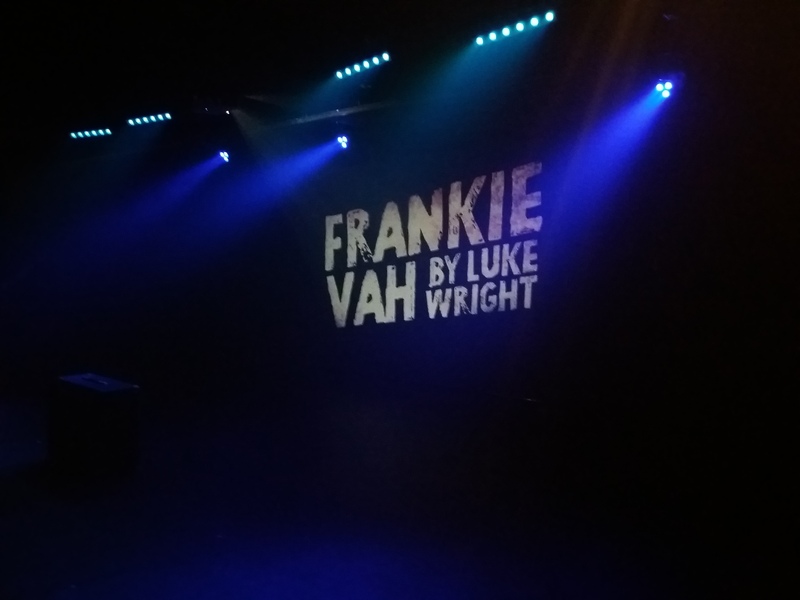 For a play about the 80s, Frankie Vah made me think a lot about current politics. About idealism vs compromise. About what art can do to change the real world. The show is currently on at the Soho Theatre, but if you can’t make that, then the script has been published by Penned-in-the-Margins. It kept me company on a recent trip to Ireland. It’s that time of year when Present James commits Future James to attending lots of events, even though Current James can’t stand the idea of going out two nights in a row. It’s great that the Fringe brings so much great entertainment, but it would be better to have it spread out across the year. There are too many things happening in a short time. Of course, May’s highlight will be seeing the full version of Rosy’s show Passionate Machine. She performed a version of this in a previous fringe, and since then has been working with producers and dramaturges, meaning that the new version will knock people’s socks off. You can read about it in this interview with Rosy. I’m going to the Monday show. Sh!t Theatre’s Letter to Windsor House is one of my favourite ever theatrical things, and I can’t wait to see DollyWould. I saw a version at Latitude last year and it was great: cloning, body farms and Dolly Parton! The main festival is curated by David Shrigley, whose contributions include Life Model II, which replaces “the live model with David Shrigley’s caricatured sculpture of a nine-foot-tall woman“. So, not problematic at all. Kate Shields is one of the people appearing at a (free but ticketed) discussion panel at Fabrica on May 2nd, Between Artist and Model. Is this the art equivalent of an automated till? Sunday May 6th, there’s a fun double bill at the Dukebox, with two spoken word shows on the same evening. Luke Wright is performing his Down the Pub show, a relaxed pub set. Earlier that same evening, Jonny Fluffypunk has a show at the same venue, How I Came To Be Where I Never Was. I’ve no idea what to expect from The O.S. Map Fan Club, but I don’t see how a show on that topic won’t be interesting. On May 26th, David Bramwell is doing his The Cult of Water show. There are a couple of good events at the Bosco Tent about theatrical genius Ken Campbell. His daughter Daisy is doing her show Pigspurt’s Child (“a romp through Ken’s legacy of lunacy, and a quest for Daisy to make peace with the gap he has left”) and there is a night dedicated to Ken Campbell too. Rosy Carrick is an expert on weightlifting, so was definitely up for seeing Brawn. And, of course, the surprise return of Dynamite Boogaloo! I was sent the above photograph by Chris, who took it in Barcelona. The lighting might not be perfect, but you can make out the graffiti: DEAN. A long time ago in Brighton, there was a graffiti artist who wrote that same word in huge capital letters. I’ve written about DEAN in the past; despite the unsophisticated tag, the genius placements made DEAN my favourite graffiti artist. I read a rumour that the artist had died fleeing from the police. 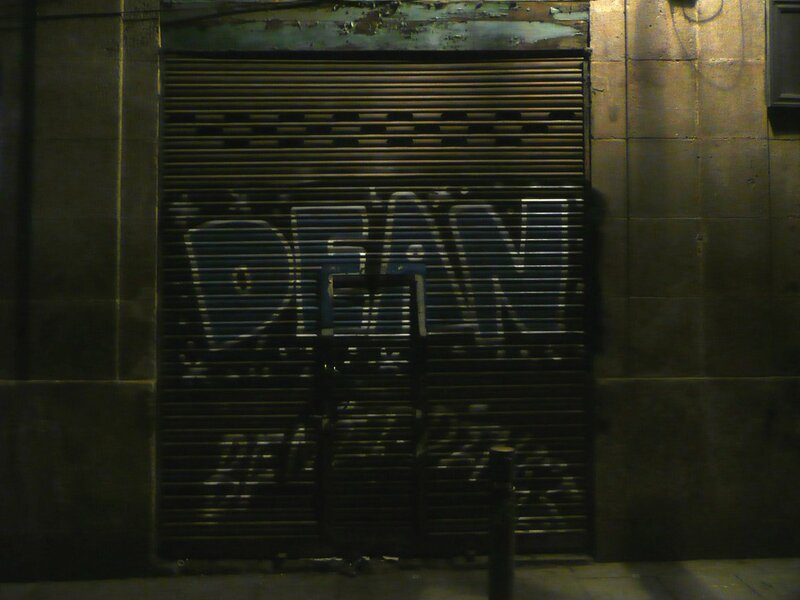 But seeing this picture from Barcelona, I like the idea that DEAN moved to Spain, and has lived a life so wonderful that they have added colour and sparkles to their tag. When I tell people that Kanye West is this era’s Bowie, I’m not trolling. Or, at least, I’m not just trolling. I honestly believe that Kanye West is one of the most interesting artists working today. Of course, any such comparison is disgusting. Why should one artist be pitted against another? It’s wrong to try scoring such individual careers against each other. But the comparison does have one positive, in trying to stop people from dismissing Kanye as untalented or mad, while Bowie is uncritically considered as a genius. Bowie took some great risks. He was mocked for Tin Machine and his early love of the Internet, but he took those steps regardless of the response. The music press was cruel about Bowie’s experiments with jungle, as if they wanted more of the same, year after year. And the whole reason we remember Bowie is that he was controversial – that moment, now so overdetermined, on Top of the Pops – most people who hate on Kanye now would probably have been hating on Bowie back then. You know: he’s not great like the Beatles or Elvis, is he? 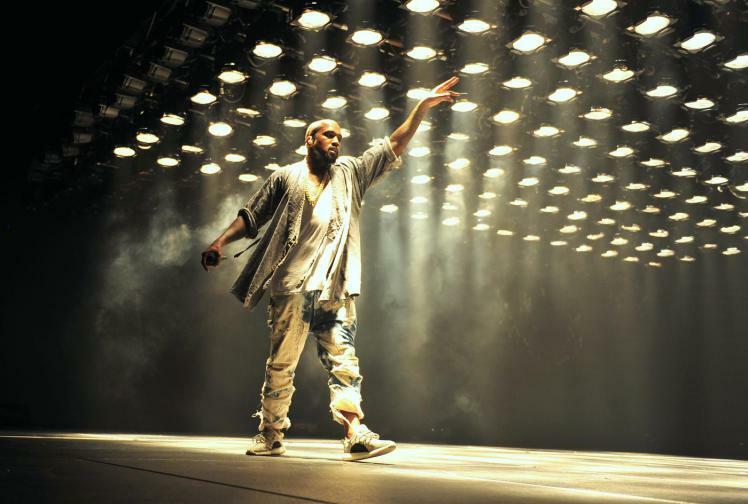 Kanye attended art school before dropping out to become a producer – and a massively successful one. That work alone assured his place in rap history, before he made his own tracks. People might mock the fashion work, but Kanye has put in the time, moving to Rome to intern with an Italian brand. West is constantly experimenting and playing. Not all of it works, but hey – Bowie had Dancing in the Streets and the Laughing Gnome. People want that hit that’s as easy as Space Oddity: the three minute track that explains the artist. Whatever. Kanye West is a fascinating artist and there’s a lot to look at. If you don’t want to engage with it, fine, but don’t assume that makes the work worthless. If you are looking for an interesting starting point, there’s this ten minute video on The Voice as Instrument, which I love. And there’s an entire podcast series on My beautiful dark twisted fantasy, which I really need to listen to. Famous for 15 People is an ebook of my writing. It came out last year, but I’m only now getting around to officially launching it, with an event at Brighton’s Regency Town House on March 15th. I’ve described Famous for 15 People as a ‘mixtape’ rather than a collection, mainly because it doesn’t have the overall theme that a collection would. Instead, it collects a range of different writing I’ve done over the years. It’s a very mixed book, but I love all of these pieces. The book contains a number of short stories that I’ve performed over the years: such as meat a story about vegetarian kink; or We have always lived in the Slaughterhouse, about a family forced to hide from abuse. There’s a story about Kurt Cobain and the clown-horror Death of a Ronald. One of my favourite pieces to perform is about ventriloquism, A bad place to stick your hand. There’s also a few examples of microfiction, which I count as being stories under 300 words, preferably under 200. I’ve done a lot of this over the years through my workshop event, Not For The Faint-hearted. I’d love to do a collection solely of microfiction, but in the meantime I’ve collected some published and unpublished pieces here including Vole, Pinnochio and The Saddest Dogs in the World. Then are the horror stories. I’ve written before about my love of horror fiction. I’ve become much more comfortable with working in this genre over time. One of the pieces in the book, In the Night Supermarket, was part of a magazine competition to find exciting new horror writers; I wish I’d followed up on that more. Death of a Ronald certainly counts as horror, and there’s also Eat at Lovecraft’s – a story I love, but one that frustrates me as I’ve no idea where it came from. Some of the horror pieces comes from my project Lovecraft in Brighton, a weird book that adds a new story with each copy sold, something I hope will begin moving again soon. There are also a couple of pieces of non-fiction, one of them a history of vindaloo, the other a commission I withdrew about Britpop, memory and nostalgia. It’s a wide range of pieces, all tied together by an introduction from Rosy Carrick. I’m proud of each of these pieces and it’s good to finally give them a home. On March 15th 2018, I’m holding a Brighton launch for my ebook, Famous for 15 People. It takes place at Brighton’s Regency Town House, and features performances from me, Rosy Carrick and Chris Parkinson. Tickets are available online and cost a mere £4. There’s even a bar at the venue. Many of the stories had their origin on the Sussex university creative writing MA, where I first met Chris and Rosy. I’ll perform a couple of regular pieces, as well as some multi-media performances that I’ve only done once before. There will also be some microfictions; and I’m going to talk a little about why ebooks are so exciting as a way for people to share their writing. I describe Famous… as a ‘mixtape’. It contains short stories (some very short!) and non-fiction written over the last ten years. The title comes from a quote from the artist Momus that I love. I’m pleased to have made a home for all these stories. The book actually came out in May last year, but I got distracted by work and other events, so the launch never happened. I am the worst self-promoter ever – as you can also tell by the fact I’ve got multimedia performances I loved that have only been performed once. Do come! Tickets are £4, and the book can be downloaded from Amazon. And if you do get a copy from Amazon, please leave a review! I’m loving the Fire and the Fury. Wollf’s book feels like a DeLillo novel, with its portrait of a property tycoon who accidentally becomes president. The hubris of it all is incredible, as is the portrait of a man who exists only through media. “He was postliterate – total television”. Obviously, all the best bits are in the excerpts you’ve already read, but the novel itself is stunning. The concept is a far-fetched in places, but once you suspend your disbelief it’s enthralling. I’m only a quarter of the way through, but I fear for the nuclear tragedy the author is setting up. Basically, our universe has been invaded by a fiction. 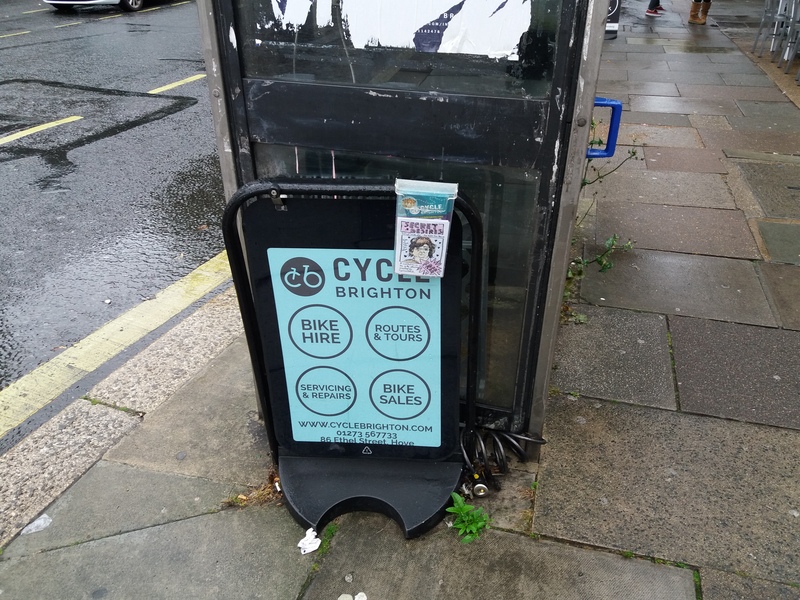 I don’t normally take Brighton busses, but I was running late. I’d had to pick up a parcel then head into town, so I was waiting for the number 7 near Hove station. Bored, I spotted something odd in a box of leaflets. At first I thought someone had sneaked in a flyer. Moving a little closer, I saw it was a zine. So I picked it up and read it. 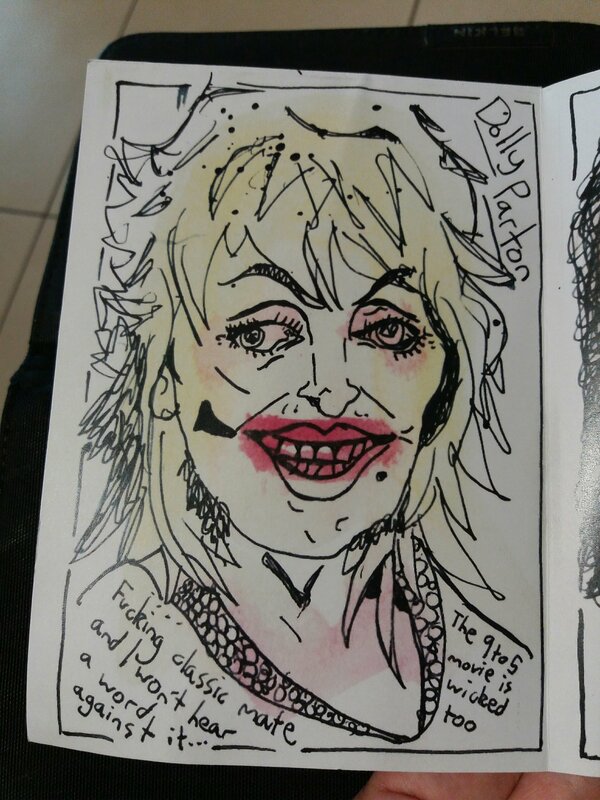 This is the sort of thing I love about zines. You certainly don’t get this from a website. You don’t find websites carefully hidden when you’re wandering away from your usual routes. 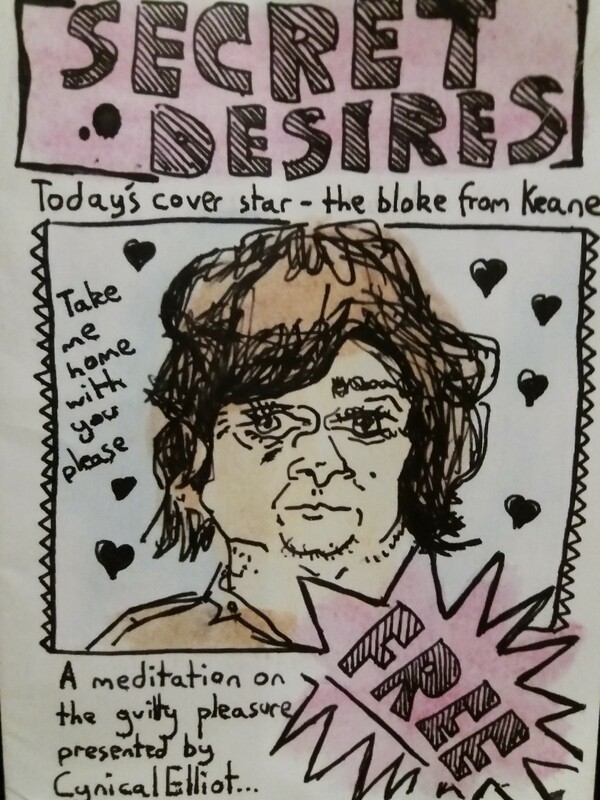 Secret Desires is by Cynical Elliot, and the cover features “the bloke from Keane”. Now, there’s a band I’ve not thought about in years. I’ve listened to their records in the past, but can’t recall the names of any songs without checking Wikipedia. The zine features portraits of various musicians, and invites us to “leave our musical prejudices at the door”. Now, I’m giving no quarter on my dislike of Jamiroquai’s music, but Dolly Parton I do have time for. And Bananarama. Finding this on the way to work was a Good Thing. 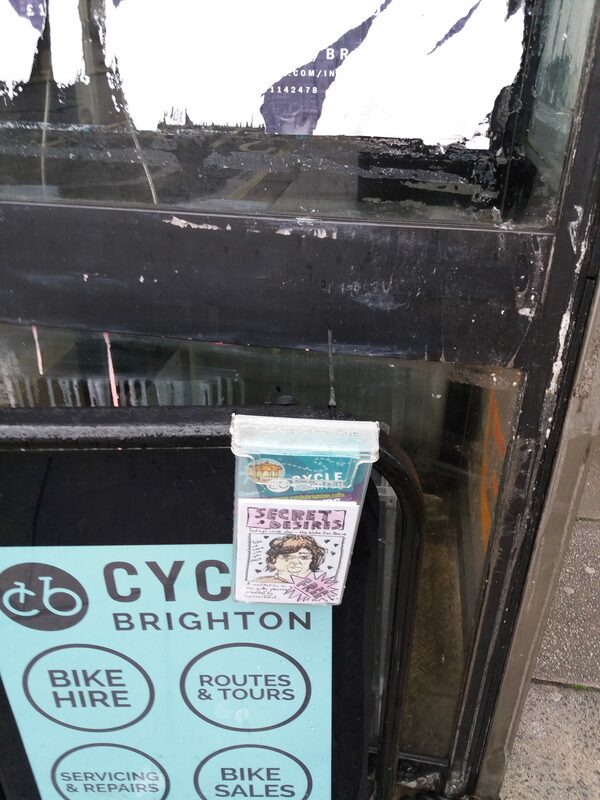 I love the idea of media that’s not tied to clicks and referrers, but is distributed by leaving it somewhere. Maybe there should be more of this sort of thing. (Maybe I should be doing this sort of thing?). Media like messages in bottles. One of the most moving pieces of art I’ve seen was a video by Emilia Telese. It was shown late at night in Brighton’s Lanes. Down one of the narrow twittens, a window was open to a room where the film was projected onto a wall. It showed the artist sleeping outside in the New Forest. Much of the emotion came from the story behind the piece; but also the vulnerability of someone sleeping out of doors. I think there should be more art around sleeping – not just portrayals of sleeping, but involving actual sleep. Like this theatre show Lullaby, where the audience was supposed to fall asleep. Sleeping used to be a communal act, not a private one. It’s something I’ve been wondering about with my Alexa experiments, thinking about skills that can be used in that near-sleep state to lull you towards dreams. But, although I’ll never have time to work on such a thing, there is one piece of sleep technology I would love to see. Since it is also possible for dreamers to receive sound cues from the outside world, we now have the technology to connect lucid dreamers to one another, to send messages between them. I’ve been thinking about this sort of technology for a few years, but it turns out to be closer than I’d realised. People have built prototypes for controlling robotic arms from within dreams; or there are software projects to take transcriptions from dreams. This sort of thing has little practical use, but it could make produce some interesting art. Yesterday evening I was in Dublin airport, on the way back from a business trip. I had a few books to read (including Naomi Foyle‘s new novel) but I felt jittery and a little burned-out. I needed something light, so instead I settled down to read John le Carré’s second novel, A Murder of Quality. Similar to the previous book, A Call for the Dead, this is a mystery – although this one has no connection to espionage. A woman in fear of her life contacts a newspaper. The editor calls in George Smiley, a colleague from the war who has now retired. Smiley learns that the woman has since been murdered and sets off to Carne school where he is drawn into the investigation. This recruitment of a retired spy reminded me a little of Tinker, Tailor, Soldier, Spy. The mystery itself isn’t particularly exciting; there’s the obvious suspect, the red herring and the culprit. On the way we get some satirical social comment. The school’s masters are grotesque snobs, unprepared for the changes coming in post-war Britain. The rigorous social codes and how characters are classified as being the ‘right sort’ or not are terrifying. Arch comments are made about Smiley’s lack of a dinner jacket when invited to supper. One character is admired because “she did such clever things with the same dress”. Smiley doesn’t like this world, but is at home in it. We see how traumatised Smiley is by his experiences: “so many men learnt strength during the war, learnt terrible things, and put aside their knowledge with a shudder when it ended.” Despite being very good at his job, Smiley is repelled by this, having “the cunning of Satan and the conscience of a virgin”. He takes little pride in solving the mystery. I wouldn’t have read this book were I not reading the complete Le Carré. Like 1971’s the Naive and Sentimental Lover, if suffers in comparison to the spy novels – although the tone and ambience are interesting in places. Next up, however, is the Spy Who Came in From the Cold.